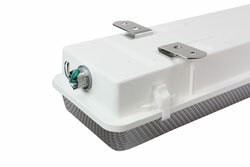 The Larson Electronics HALP-96-2L-LED Hazardous Area LED Light Fixture is U.S./Canada UL Listed Class I, Division 2 Groups A, B, C and D, UL 1598A listed, and is specifically designed to handle the rigors of wet and corrosive marine environments. This eight-foot hazardous location LED light has a T4 temperature rating and carries a United States Coast Guard approval, making it ideal for applications such as oil rigs, ships, offshore applications, petrochemical, manufacturing, chemical storage, and water treatment centers. This eight-foot LED fixture with four LED lamps is ideal for operators seeking a top quality hazardous location light that will reduce operating costs, improve lighting quality and reduce downtime incurred from frequent servicing intervals. 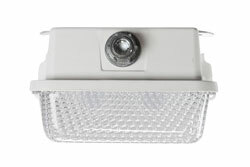 The HALP-96-2L-LED hazardous area LED light fixture is designed for use in wet areas and saltwater-marine environments where corrosion resistance is critical to equipment longevity and safety. This Class I, Division 2 rated fixture is constructed of non-corrosive materials including a polyester housing reinforced with glass fiber, a poured in gasket for reliable sealing and an impact resistant acrylic diffuser. A total of 16 corrosion resistant plastic latches secure the lamp cover to the housing and provide a firm lock against the poured in seal to prevent drips and water intrusion. We now offer our second generation LED tube lamps with this fixture which have increased this hazardous location light’s performance. This HAZLOC LED linear fixture is lighter in weight and produces more light than equivalent hazardous location fluorescent fixtures. The four LED tube-style bulbs included with this unit are rated at 50,000 hours of service life, which is over twice as long as standard T8 bulbs. The HALP-96-2L-LED is UL 844 rated and Class I, Division 2, Groups A, B, C and D. This fixture also carries a UL 1598A outdoor marine rating and meets US Coast Guard specifications. This lamp offers the extreme durability, high efficiency and long lamp life of high power LEDs in a proven hazardous location fixture design, making it a reliable and affordable lighting solution for open areas where flammable chemicals and vapors may occasionally be present. Click here to read the NEC description for explosion proof and hazardous locations. We have eliminated the ballast box normally associated with fluorescent fixtures which reduces overall weight and creates a slimmer unit profile. There is no ballast in this unit and the included LEDT8-28W-V1 LED lamps have a 50,000+ hour service life, both of which result in extreme efficiency and greatly reduced maintenance costs. The solid state design of the LED lamps give this fixture superior resistance to damage from vibration, extremes in temperature and a lamp service life over twice that of standard fluorescent bulbs. Unlike the glass tube design of traditional fluorescent lamps, these LED T-Style lamps have no filaments or fragile housings to break during operation. Instead of using a combination of gases to produce light, light emitting diodes (LEDs) use semi-conductive materials that illuminate when electric current applied and emitting light. The LED assembly is mounted to the "tube" constructed from extruded aluminum, with a polycarbonate lens protecting the LEDs. With LED lights, there is no warm up time or cool down time before re-striking and provide instant illumination when powered on, adding to the reliability of LED technology. By nature, LED light sources run significantly cooler than fluorescent lamps, reducing the chance of accidental burns and increased temperatures due to heat emissions. This solid state design of light emitting diodes provides a more reliable, stable, durable, and energy efficient light source over traditional fluorescent lighting. The LED lamp produces a total of 14,000 lumens at 120 lumens per watt. The HAL-96-2L-LED is universal voltage, not multi-tap, and operates on any voltage from 120V to 277V AC 50/60hz without any modifications. We also make a 12/24V AC/DC version for low voltage applications for AC or DC power. Unless otherwise specified, our standard, most popular configuration is the flange mount shown enlarged below. We also offer a pendant mount for those needing to suspend the fixture away from the ceiling surface (i.e. suspend from pipe or conduit). Additional mounting configurations can be customized to meet the requirements on the application. Please contact us for special mounting configurations. Flange type stainless steel mounts attached at each end of the fixture enables it to be simply secured to any surface. The mounts provide some shock absorbency protection while enabling the user to simply mount the fixture with the through-hole taps that protrude on each side of the fixture. The mounting holes are 38.25” on center apart along the top of this hazardous location light. The mounting holes are 7.2” on center across the top of the light. Pendant mount fixtures hang from the ceiling and are suspended by rigid pipe. Each fixture is equipped with either two 1/2" or 3/4” NPT hubs, one on each end of the fixture. Operators bring rigid pipe down to the threaded mounting hubs. Wiring is fed down through the rigid pipe to one of the NPT hubs and tied in to the fixture’s lead wires, completing the electrical connection. The remaining pendant hub provides support for the opposite end of the fixture. Suggested Applications: The HALP-96-2L-LED is designed for marine, wet, damp locations where corrosion resistant fluorescent lights are required or are already present. This includes petrochemical facilities, lubrication pits, oil drilling rigs, crew quarters, solvent/cleaning areas, water treatment areas, processing plants and marine loading docks.